This page contains information on how to properly format your cover page (title page) in APA using the latest APA Manual. Your APA format title page should include 5 elements: running head, your paper’s title, your name, your University and author note (if required by your professor). – this header should be 1 inch from the top. Some teachers say 1/2 inch is okay too. 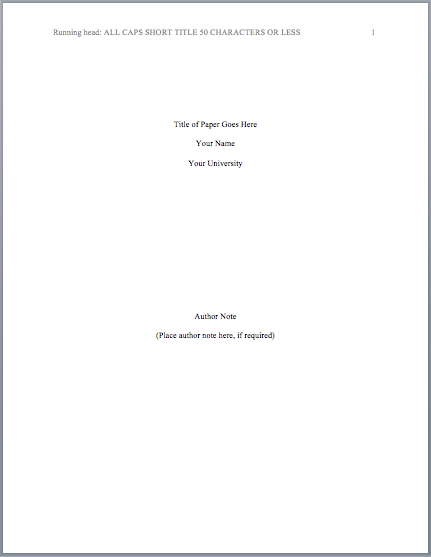 Paper title: Place your paper’s title in the upper half of the page, centered, capitalize the first letter of important words in your title. Your name: Place your name below your paper’s title, centered, double-space. If your paper has two or more authors, place the word “and” without quote between the names. Your University: Place your University’s name below your name, double-space. Tips: If your professor requires you to include his/her name, course title, etc… place these below your University name, double-space, on separate lines. Thanks for this, it really helped me! This is very sweet of you. Thanks for making this page for me. If there are multiple maker of the paper, do I have to alphabetize the names or does Alphabetization apply for multiple names in the front page. The information provided is very helpful. I used your MLA format instructions for Pages in MacBook Pro and have been searching for the same thing for APA. However, I cannot find one on your site and I think you have the very best for the MLA. Is there one for APA with instructions for Pages. APA Format does not have footer correct? I did not know this edition until now. It’s also good for academic ics. Hi Leigh! APA 6 is the most current edition. Is there an APA 9? We have the latest windows and it only has APA 6.